Jeff Bacon started fishing at the age of 4 and began fly fishing in 1974 at the age of 9, when he and his father Ron went out west to visit his dad’s college buddy in southwest Montana. It was on the banks of the Big Hole River that his first Grayling was caught, knots learned and skills began to develop that would serve him well in the years ahead. Through high school, college and beyond, the draw of the river never lost its appeal, in fact…..it grew stronger. After many years in a home furnishings retail business, Jeff decided to take a “break” from the traditional work life…….that was over 20 years ago ! Jeff now guides on many West Michigan river, including his “home water”, the Muskegon river, as well as the Pere Marquette, Manistee ,White , Rogue , Grand and Flat rivers for cold and warm water species of fish, including Chinook and Coho salmon, steelhead, rainbow and brown trout, as well as Smallmouth Bass and Northern Pike. 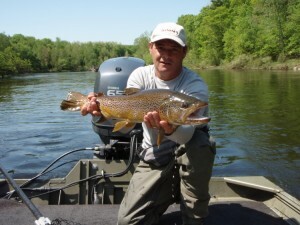 As a fly casting instructor, he has taught hundreds of anglers various tactics and techniques used to chase warm and coldwater species of fish with a fly rod. From the delicate presentation of a # 18 BWO, to roll casting an “indi-rig”, stripping rodent size streamer patterns on bigger rods or learning the fundamentals of spey casting. For those looking to just “get out and fish” or maybe joining a friend who is a fly fisher, Jeff will also utilize light spin tackle gear for those individuals who prefer to use that or instances where it’s beneficial to have choices in fishing equipment. From individual instruction to group outings, most any request can be accommodated, please call or email for more details. Jeff lives with his wife of 16 years and two young sons in the Grand Rapids, MI area.